Since the game’s release earlier this month, it became quickly apparent that the most overpowered Pokémon in the game was Vaporeon. Well, not quite THE strongest, but the most powerful Pokémon you could easily get your hands on – provided you can snag a measly 25 Eevee candies and get the luck of the draw. For many this has become frustrating, as just about every gym you go to battle you’ll find at least one Vaporeon. That may have finally changed. 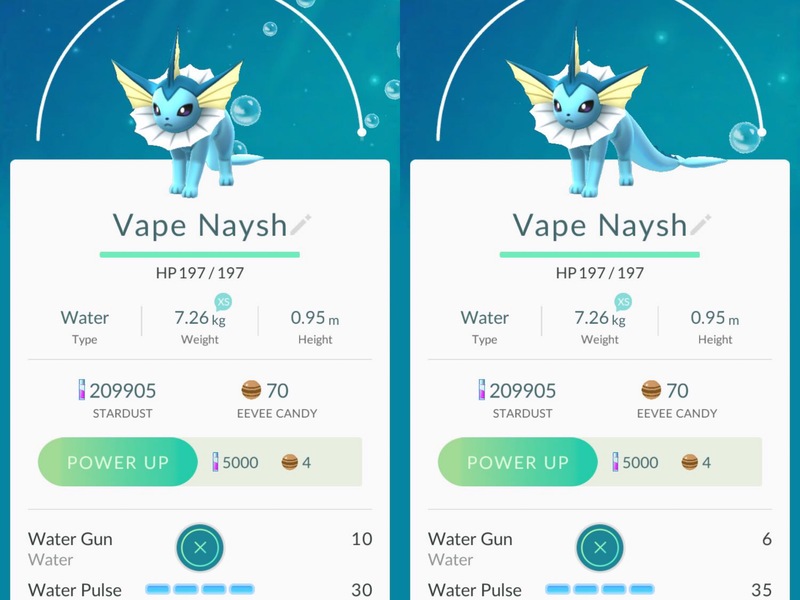 Reddit user cortanabae has discovered that his Vaporeon’s moveset has noticeably altered. Water Gun getting nerfed from 10 > 6 is game changing. That’s a 40% less powerful attack on the game’s most overused Pokémon. But that’s not all that’s changed. Many other moves were nerfed, not just for Vaporeon, but for a wide range of attacks from all Pokémon. And other moves have been buffed to help balance the game. This is great news, because a balanced game makes for better gameplay. Anywho, find a list of all the known nerfs and buffs that were made below, in alphabetical order. Hopefully you guys get a Dragonite with Hyper Beam, because that’s going to seriously dominate. If I’ve missed anything, please let me know in the comments below. The other day I saw a “shadow” of a Dragonite in the nearby list, but because the footprint tracking system is still broken, I wasn’t able to find it. Hopefully it’ll pop again one day. It’ll definitely show up again. And yeah, I’ve played around with the Eevee trick. So great. I don’t know if it works a second time however. It hasn’t worked for me on attempting to name them again.